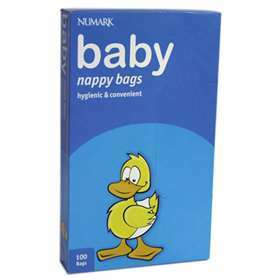 Numark Nappy Bags - 100; a convenient and hygienic way to seal soiled nappies prior to disposal. Lightly fragranced to mask unpleasant odours from soiled nappies. Perfect for when you are out and about. Place soiled nappy in the bag and tie the handles together securely. Dispose of the bag with your normal household waste. Do not use for food items.